SAN FRANCISCO -- Several Bay Area highways have been closed today as storm-related weather conditions persist throughout the region, creating hazardous conditions for drivers. Caltrans officials said Tuesday morning they have closed at least eight highways due to storm-related damage. Four westbound lanes of Interstate 80 near Cordelia are closed due to flooding. In Novato, state Highway 37 has been closed between U.S. Highway 101 and Atherton Avenue because of flooding. An estimated time for when the highway would reopen was not given. Caltrans crews are currently on scene and attempting to pump water out of the roadway, California Highway Patrol officials said. The highway, which has proven vulnerable to flooding, has already been closed twice for days at a time this year alone following heavy rain. Also in Marin County, Caltrans has closed state Highway 1 in both directions between the Panoramic Highway and Muir Woods Road. Caltrans officials estimated the highway wouldn't reopen until March or early April. In Sonoma County, state Highway 12 at state Highway 121 has been closed. No estimated time for when the highway would reopen was given by Caltrans officials. Also in Sonoma County, one-way traffic control is in effect on Highway 1 four miles north of Jenner. In Alameda County, state Highway 84 is closed from Mission Boulevard in Fremont to Main Street in Sunol, with no estimated time for reopening, according to Caltrans. Highway 84 has also been closed in San Mateo County, near Portola Valley. The highway is closed just west of state Highway 35 with no estimated time for reopening. A landslide is seen on Highway 17 in Scotts Valley, Calif. on Tuesday February 7, 2017. In Santa Clara County, state Highway 9 has been closed from Redwood Gulch Road, just east of Saratoga, to the Santa Cruz County line. 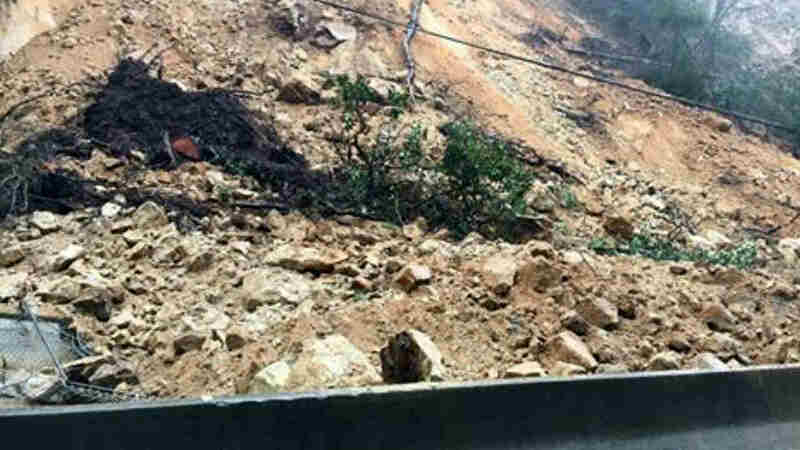 Caltrans officials estimated the highway wouldn't reopen until Sunday morning. Also in Santa Clara County, state Highway 152 has been closed between Pole Line Road in Santa Cruz County and Watsonville Road, near Gilroy. Currently, there is no estimated time for when the highway would reopen, according to Caltrans. In addition to the highway closures, several lanes and on-ramps and off-ramps throughout the region have been temporarily closed. Drivers are being urged to use caution and to never attempt to drive through flooded roadways.